At a campaign rally in Michigan yesterday, US President Donald Trump indicated that he would meet with North Korean leader Kim Jong-un in the next “three or four weeks,” at a still undisclosed location. His supporters chanted “Nobel,” Nobel,” echoing calls by Republican Party congressmen for Trump to be awarded the peace prize, just as Barack Obama was in 2009 even as his administration continued the occupation of Iraq and escalated the war in Afghanistan. Trump boasted that the talks last Friday between Kim and South Korean President Moon Jae-in were the outcome of his “strength”—meaning his administration’s reckless threats to “totally destroy” North Korea unless it submits to US demands to give up its nuclear programs and dismantle its nuclear weapons. Over the weekend, further details of what was and was not agreed was revealed by both the South Korean government and Trump’s new secretary of state, former CIA director Mike Pompeo. In early March, the North Korean regime announced its willingness to hold “denuclearisation” talks. China’s collaboration in enforcing harsh sanctions has reportedly caused the country’s exports to collapse by more than 90 percent. Militarily, North Korea could not hope to defeat the combined forces of the United States, South Korea and other US allies without substantial Chinese assistance. If it used its small nuclear arsenal, it would face annihilation. Deprived of overt Chinese backing, Pyongyang has signalled its preparedness to make a deal, providing that any arrangement preserves the position and wealth of its ruling clique. The situation on the Korean Peninsula nevertheless continues to hang in the balance. During the Michigan rally, Trump repeated his previous threats to walk out of talks and return to a policy of war unless US demands are met. 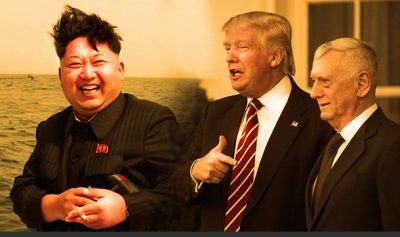 In an even more ominous comment, Trump’s newly-installed national security advisor John Bolton told Fox News that a “model” for North Korean denuclearisation could be the deal made with Libya in December 2003. In exchange for the destruction of chemical weapons and components for nuclear weapons, the major powers restored relations with the Libyan regime of Muammar Gaddafi. Barely eight years later, the US and Europe turned on Gaddafi as part of their efforts to contain the revolutionary upsurge that erupted in Tunisia and, of greatest concern, in Egypt. The imperialist powers intrigued with Islamist and separatist “rebels” to provoke civil war in Libya, then used the fighting to justify a massive air attack on Gaddafi’s regime and military. Gaddafi was brutally assassinated by the pro-imperialist rebels in October 2011. In the past the North Korean regime has cited the fate of Libya and Gaddafi as a reason to refuse to submit to the US-led demand to abandon its nuclear weapons program. While moves are proceeding toward talks, they may entirely break down over the definition of “denuclearisation” and a “nuclear-free Korean Peninsula.” North Korea may, for example, continue to insist on the withdrawal of US military assets capable of delivering nuclear weapons and the end of the US-South Korean alliance. China and Russia, which border North Korea and view it as a useful militarised buffer against the US forces in South Korea, are indicating opposition to any agreement that undermines their strategic interests. After the March 8 announcement that Trump was prepared to meet Kim, both Russia and China quickly organised their own diplomatic initiatives. Kim was invited to Beijing for his first-ever visit, and Chinese President Xi Jinping announced his intention to visit Pyongyang “soon.” Wang Yi, China’s foreign minister, will conduct a two-day trip to Pyongyang on May 2–3 to discuss developments. Russian Foreign Minister Sergei Lavrov will travel to North Korea at an unspecified date. These intrigues, diplomatic as well as military, will only escalate.